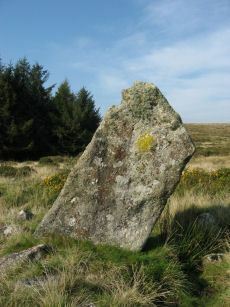 Notes: "The alleged blocking stone noted by Parsons measures 2.7m by 1.0m and has been split by drilling." TDA Vol. 85 (1953) pp. 145-147 (Hamlyn Parsons). 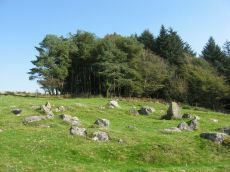 Notes: "The south terminal cairn, 9.0m diameter and 0.6m high, has a central depression, about 2.5m diameter and 0.4m deep, and is edged by 3 upright and 2 fallen orthostats, average 0.7m by 0.2m and up to 0.9m high, the remains of a retaining circle or peristalith." Notes: Turner E22. Dixon #42. Bar Rep. 40. Butler Tristis Rock - Vol. 4. Map 54.17 (p.60 diagram of Tristis Rock cairn p.59). Grinsell HARFORD 6. 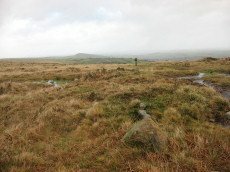 "retaining circle of a barrow, internal diameter between 16 and 17 feet and consisting of twelve stones which enclose the remaining south side stone of a cist. 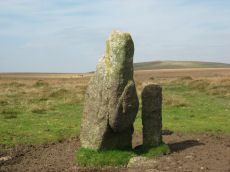 The overall length of the side stone is 4 feet 6 inches, the internal length of the cist would not have been more than 3 feet". Notes: "Within the newtake known as lower piles. A group of seven huts near the south east corner of the enclosed land. 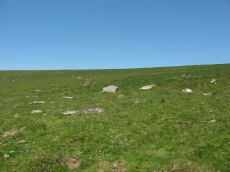 All now composed of fairly small stones the walls appearing as thick banks of stone and turf, not high, but spreading to a width of 1.8m or more. The diameters vary from c 9.20 to c 12.20m outside measurements. 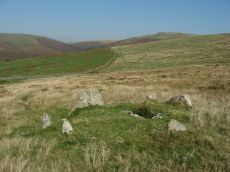 Only one hut has a well defined entrance, this is on the south east side of the circle." Notes: Turner A53. 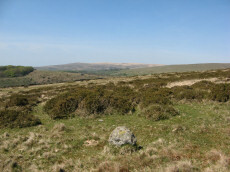 Bell cairn of Wessex type. 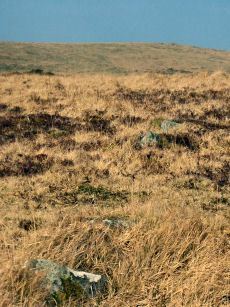 "Cairn on piles hill. 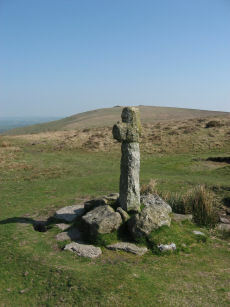 An unusual monument, the equivalent of a bell barrow in stone. 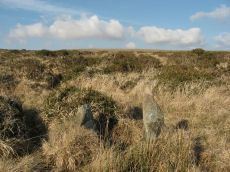 Cairn (diam 17.8m, heig 1.37m), berm(widt 3.05m), stone circle (diam 2.1m, heig 457mm)vis=12/4/1950 (os). 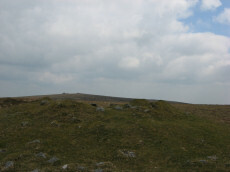 Cairn with bell disc features. Slight hollow in the centre of the tump (mound), otherwise in good condition. 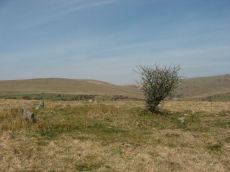 No distinct outer bank could be found, but the berm and central tump were quite evident. " 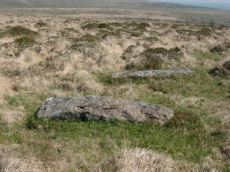 Notes: "The double stone row formed by 139 stones, 7 of which lean; the others are either stumps with drill marks, cleanly snapped off stones, or recumbent posts, whole or split by drilling. Some 30 stones exceed 2.0m. in length with a maximum of 3.0m. 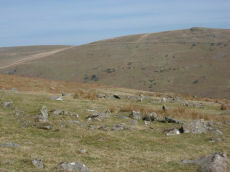 A few take the form of slabs or boulders but the majority are of post-type up to 0.6m. 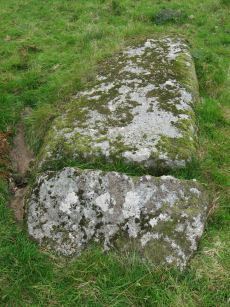 square in section, with an angled top created by a single 'chamfer'. The rows in the main alignment are from 21.0m. to 30.0m. 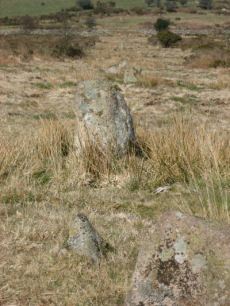 apart and within them the gaps between stones vary from 3.0m. to 30.0m. At each end the rows are close, 12.0m. to 17.0m. apart with fewer large gaps between stones". Lethbridge pp.74-6, diagram p.74. 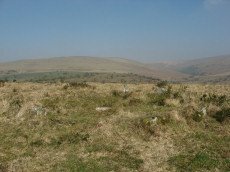 Notes: "This settlement consists of 6 enclosures, mostly in poor condition, with 13 associated hut circles and 17 detached ones and extends over 5ha of a gentle to moderate, well drained, southeast facing slope at 270m above OD."